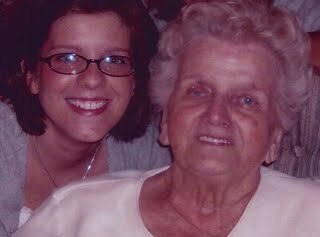 I've spoken several times on this blog of my very special Grandma, Franzi. Lola was named after her, and I get lots of my love of the kitchen from her. She inspired me every single day of my almost 31 years. When she died, my mom and aunt were gracious enough to allow me to take some things from her kitchen. Wooden spoons, bowls, spatulas--those sorts of things. My favorite thing of hers that I have are her measuring spoons, since I use them almost daily while I am cooking or baking. Every time I break out one of her things, I think of her--and it's like we have our own private moments all over again. I can almost hear her over my shoulder saying, "Add just a touch more cinnamon to your zucchini bread, honey." Ich liebe dich were my most favorite words to hear from her. I didn't hear them often, because she usually just said "I love you." But, I always remember thinking as a girl (and even as a young woman) how cool it was that my Grandma could tell me she loved me in German. For our family, it was just kind of our thing....and we've said it a lot since she's been gone. "Ich liebe dich, Grandma Franzi. We love you. We miss you." One thing that has been missing from my almost perfect kitchen is a set of canisters. Shane decided to fill that gap for me this year--he got me the most beautiful set for my birthday. They were perfect--exactly what I have been wanting for ages! At first glance, they look pretty ordinary. But then, as I looked a bit harder, I noticed that they were not perfect. They were way beyond perfect. Not that I could ever forget my Grandma Franzi. Not that she is never not with me in spirit. me through this unique and thoughtful gift. How awesome. What a thoughtful gift!! What a beautiful and thoughtful gift!!! And what sweet reminder of your precious grandma!!! OK. I could cry. seriously. and that just doesn't happen for anything. awesome! love it! Wow. Just wow. That has to be THE most thoughtful, cool gift EVER! Wow. That is beautiful!! Shane rocks for finding those. Happy Birthday!